The CFI - A Low Cost Solution to Congestion! The CFI, also known as a Displaced Left Turn (DLT), and Crossover Displaced Left (XDL), was first seen in Mexico over 20 years ago, where there are reportedly upwards of 50. They are catching on fast in the United States. The nation's third opened in April 2006 in Baton Rouge, LA for a total cost of $4.4 million. Where vehicles had been delayed an average of 4-minutes before the project, this was reportedly reduced to below 1-minute after. The fourth CFI opened in Salt Lake in 2007, and a month later the fifth opened in St. Louis. These state DOTs have been so impressed that many more are under construction, and even more soon will be. 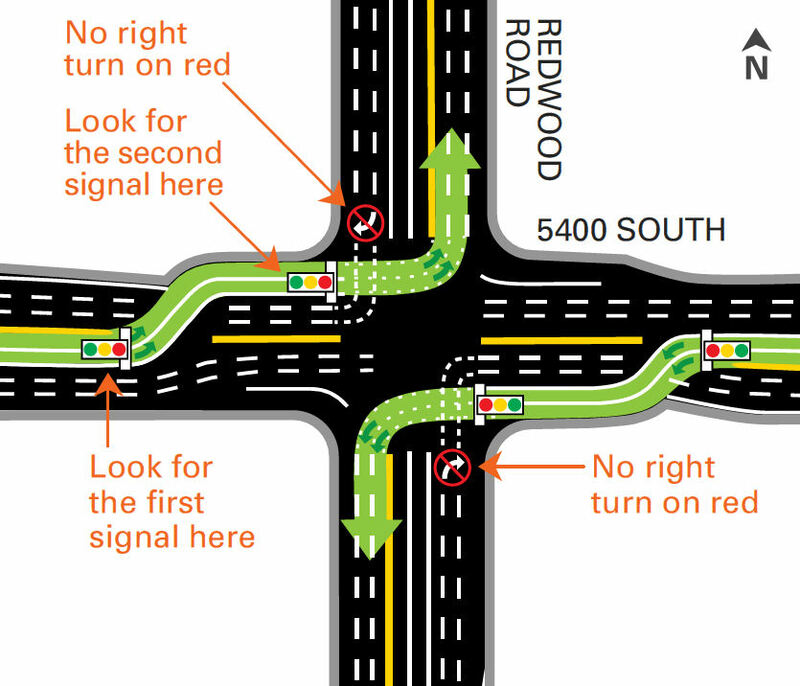 At a traditional intersection, through traffic must wait while left turns get their "arrow." The magic of a CFI is that it allows opposing lefts and throughs to occur at the same time using one signal at the main intersection, and up to four interconnected mid-block signals (one for each leg that has the CFI strategy). For example, while east-west traffic is moving, lefts on the north-south street cross-over oncoming traffic at a mid-block intersection. Then when north-south signals turn green, both through and left movements can go at the same time, because lefts are already on the opposite side of the throughs. 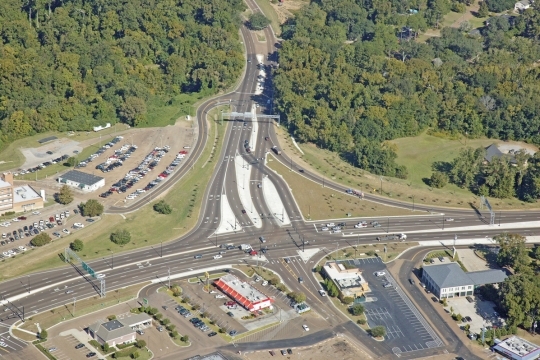 It looks complex from the air, but has proven simple for drivers to understand. Controlled simulations suggest that CFIs can reduce intersection delay between 20-90%, depending upon conditions at the site. Capacity or throughput also increases by 15-30% or more. 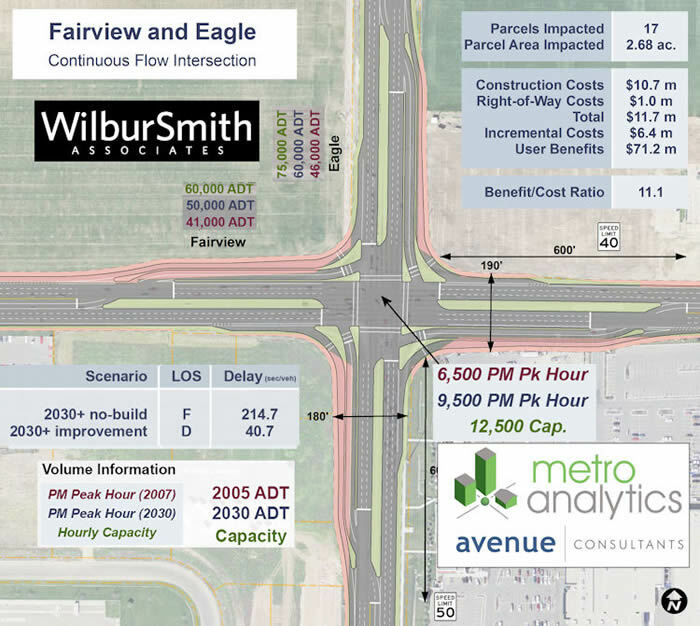 Costs are expected to be about 25-50% higher than building a traditional intersection, excluding right of way costs. to just 40 seconds, creating a benefit/cost ratio of 11 to 1! Simulation of left-turning vehicles crossing over while the cross street is running. 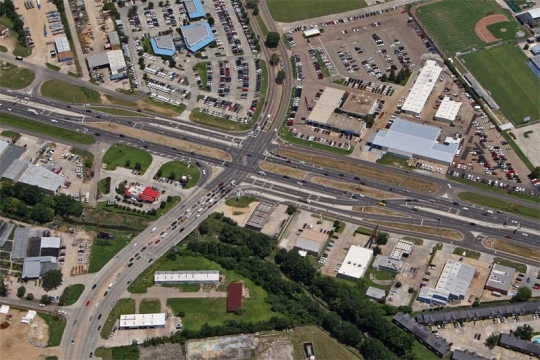 Continuous Flow Intersections, and "cousins" called the Parallel Flow Intersection, and the Continuous Flow Interchange, are among a series of concepts collectively known as Alternative Intersections, Alternative Intersections, or even Unconventional Intersections. 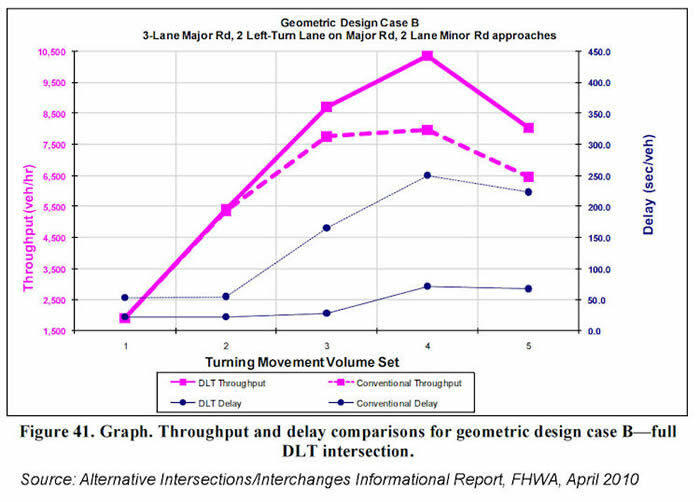 The key trait that links all Alternative Intersections is that they successfully eliminate the "left-turn arrow" phase, which otherwise reduces intersection efficiency considerably. 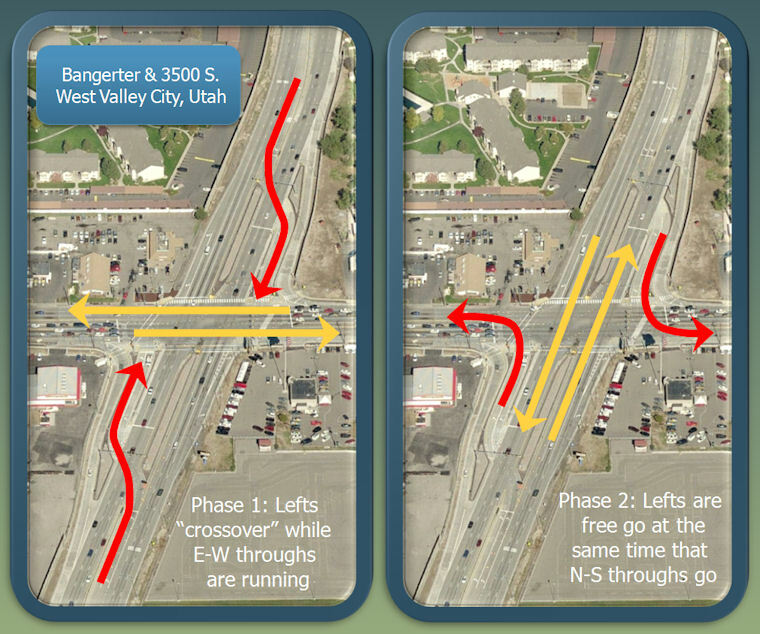 So instead of your choices being either 700-800 vehicles per hour per lane as the maximum throughput of a typical arterial street, or constructing a bridge to get 2200 vphpl in one direction, but almost no added benefit for the cross street, now there are choices low-cost solutions that land somewhere in the middle and create benefits for all movements. The CFI and other Alternative Intersections such as Median U-Turns, Bowties, Quadrant Intersections, Town Center Intersections, Roundabouts, Diverging Diamond Interchanges, and others can all be found at www.alternativeintersections.org, where you can search for every Alternative Intersection that exists or has been planned anywhere in the world (or at least those that our members are aware of). This site as well as www.alternativeintersections.org, are sponsored by www.metroanalytics.com.